A client emailed me asking for my email address. This week’s MightyDeal gets you lifetime access to one of the best resource libraries for web developers, designers and programmers. 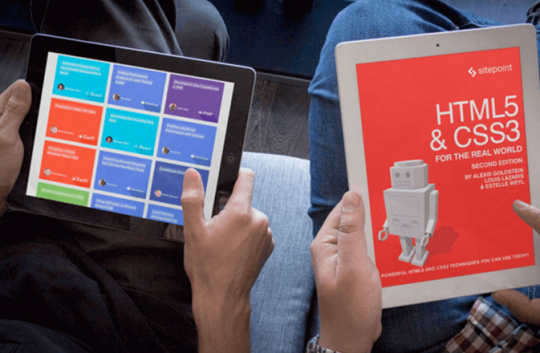 Through thousands of books, videos, tutorials and screencasts, you can learn to master topics from HTML to PHP to Design & UX. New resources are constantly being added! Normally, a lifetime membership to SitePoint Premium sells for $450, but for a limited time only, you can get access to this incredible resource library for only $44! That’s a savings of 90% ($406!) off the regular price! Client: I don’t like the color of the title. I really want it to pop out from the background. Me: The test and background are complementary colors. It’s hard to make it pop more. Client: Try putting the title in Orange! Orange always pops out! Client: Why not? I’ve seen it before. I like orange! Me: Because orange text usually doesn’t work that well on orange background. The poster was approved fifteen minutes later with no more changes. Recently we had an official photographer come in to take photos of our office for our website. The manager was worried the photos that were taken didn’t show enough gender diversity, so he added some stock photos of women who don’t actually work there (you know, instead of hiring more diversely). The best part? Most of the stock photos are of women drinking tea in the “break room.” Otherwise known as the kitchen. A client wanted to make a fundraising video for a new community project headed by her business. Client: I gathered all the image files we’ll use and e-mailed them to you. I figure we don’t want more than two minutes for the video, and I’ll be working on a script and send that to you to check over and see what you think. Me: Great! Two minutes is an excellent goal! I’ll take a look and let you know what we can use and maybe some suggestions. Client: Oh, I was very careful in choosing. I narrowed it down to only ones we definitely have the space for, so we’ll use all of them. The e-mail had forty photos. Some were really artistic, but busy – it took a little bit for your eyes to adjust and react. Which wouldn’t happen, because at forty pictures for two minutes, the slideshow would have to change every three seconds. Client: The forest photos are there to rest the eyes. Thinking I could wait and link up some of the better shots with the script, I wait for the script to reply. But the script was three pages long and had nothing about raising money or the project’s needs – it was just a history of the business and a lot of really awkward information about it being spiritually significant. Me: I’ve reviewed the materials you’ve sent me, and let me just say that I’m excited to work on this project. But I do have some design suggestions. At this point, I explained as kindly as possible that people can’t pay attention to a quick sideshow AND an information dump, and that they would have to describe the charity if they wanted to raise money. I included a script for a 2:30 video and tagged 10 images that I would use. Client: I don’t appreciate how you hacked up my work! I did a lot of research! You’re supposed to get pretty pictures and make people feel good with the video – which is exactly what I did! And if I read my script fast enough I can definitely squeeze it into two minutes! My FAVORITE client request of all time. Client: (interrupting) The users’ needs are irrelevant. I could care less if they like it or not because they will have no choice. I’m the one calling the shots. I immediately declined the job. I work at a small marketing agency that deals with a lot of real estate firms. I got the assignment to revamp a commercial real estate company’s old logo. It was really just an outdated serif font of the company’s name with very little else. Client: We don’t really know exactly what we want, but we do want a different font in the same color as the original. We’re not trying to reinvent the wheel. It seemed to me they were going for a more conservative approach. I sent them a few designs that were austere and stylish, but not particularly flashy. Client: These have no “wow” factor. We’re looking for something unique and appealing. Something that will get people talking. And please, make it more colorful. Client: That looks amazing! Can I get the files? Me: Sure! Is a Photoshop file okay? Client: Send all of the files, please. Me: Well it’s only the one PSD file. Everything you need should be layered properly. I’ll make sure to label it for you. Client: Okay that’s great, thanks. Some time later after the file is sent. Client: Thanks! I don’t have PowerPoint though. Can I get a JPG or a PNG instead?